Greetings, my very beloved friends here. Blessings and love envelop you and penetrate your very core. With joy do I resume my communication with you. I say resume, although this communication has never really been broken. Most of you can feel clearly that you are deeply involved in a magnificent process—the process of the spirit penetrating that which has alienated itself from the spirit. As I have explained before, the alienated part is on its own and creates its own momentum. It becomes involved in this momentum, creating and recreating its own patterns. Translated into human terms, this means that negative creation seems to be the stronger aspect in people’s lives. They appear to be caught in it, unable to reverse this pattern. They seem to be its victim and do not realize how they directly created this movement that carries them. On this path, with the work you have done, you begin to realize that it is indeed possible to come out of the negative pattern of your creation, and reverse the momentum that takes hold of you as if it had an independent life of its own that has nothing to do with you. In the creation of the pathwork, of your Center, you experience and witness that this movement is part of a grand scheme transcending the volitional, conscious aspect of your being. You are now engaged in a positive momentum that is the stronger aspect, notwithstanding the continuing presence of lower-self aspects. The higher self is becoming constantly predominant. This is not superimposed in a wishful denial of the lower self. It is the result of a genuine transformation, well grounded in reality. You see the fruits of this in your personal life to an ever-growing degree, and you see the fruits in the growth and expansion in depth and width of the community as a whole. I want you to be very aware of the fact that the higher purpose of this movement goes far beyond your present life. It is preparation for important changes in evolution and you are instruments, all of you, each in your own way. Each of you needs to realize the importance of your task from an inner place that is not ego-involved, not steeped in vanity or pride. And that is possible right now. If you choose, you can know the happiness of being an instrument fulfilling a task without pride and vanity for a higher cause of the deepest significance. By doing this right now, you can further contribute to the energy and the consciousness that create this movement. The movement of consciousness is the opposite of how human beings imagine it. The truth is that the dualistic, cut-off life is not “raised,” as it is often said, into higher realms of being. This is a reversed view, reflecting a consciousness still locked into space and time-bound terms. It would be more accurate to say that higher realms come “down” and penetrate the lower realms, thus causing in them a transformation. According to the concept that lower realms raise themselves up into higher ones, the earth sphere would remain at its present level of development, while its inhabitants would rise up. This is only partially true. In the actual evolutionary movement, the earth is increasingly penetrated by the energies of higher consciousness, transforming and spiritualizing the earlier cruder energies and consciousness. This is the task in which you are deeply involved, first with your own personality, then in conjunction with higher plans for others. In the process of your individual path you experience how what is clear and truthful in you and encompasses limitless spans of being, of generosity, of love, infiltrates into the realms of the lower self with its little faithless concerns. The mass consciousness works similarly in those of its aspects which are not too resistant to embrace the movement of the Christ consciousness which is sweeping through the inner levels of reality from realms that might be designated as “higher,” more evolved and purified. As this happens, petty feelings of egotism and jealousy make way for a deep knowledge of your own value, of your right to stretch your whole being into rich fulfillment and of your unity with all other life. Let this awareness fill your soul, your mind, your heart, and your body—your whole being. Let yourself know that you are divine beauty and so is the next human being, so are all human beings. You are all one and you need not fight for what is yours. Simply claim what you were always meant to experience. However, your inner self will let you do this fully only when you purify yourself, when you become deeply honest, when you have the courage and integrity to expose all your lower-self aspects and consider their effects. Let this process motivate you for the great task of self-transformation, which is not only possible, but is the natural movement of your soul that your fear and ignorance try to stop. Let the light of truth and love fill your day, fill your actions, fill your attitudes toward yourself. Let the involuntary constructive forces of the Christ consciousness take over and carry you to create and again create, making your life the glory that is yours to behold and to experience. As you expand into it more and more, you can only stand in awe. The expansion and transformation that you witness is only a beginning. Much more is yet to come. Your own development will make you capable of sustaining the highest energies of joy and fulfillment. What you already experience in your lives and in your community is a result of combined constructive input; honest investment and commitment; thoughts, intentions and actions of the highest nature. In turn these eliminate the walls between your human consciousness and entities of high development, whose force and sphere of influence merge with your love, truth, goodwill and giving to the universe. The result is a mutuality of the highest order, that also creates the momentum that carries you. In tonight’s lecture I will speak very precisely about how such a process can be initiated in an even more conscious way, how you can change from a negative to a positive self-perpetuating motion and creation, how you can create an involuntary movement through the voluntary system. I promised to speak about the power of the word. This will be the topic now. The word creates an energy pattern of additional psychic nuclear points, each link, each point being a word too, a secondary creative agent. Each word is a blueprint essential for building the structure. The word is both expression and creation. It is plan, knowledge, opinion, consciousness. The word is feeling, attitude, and intentionality. The word carries immense energy powers of its own kind, differing from other energies. 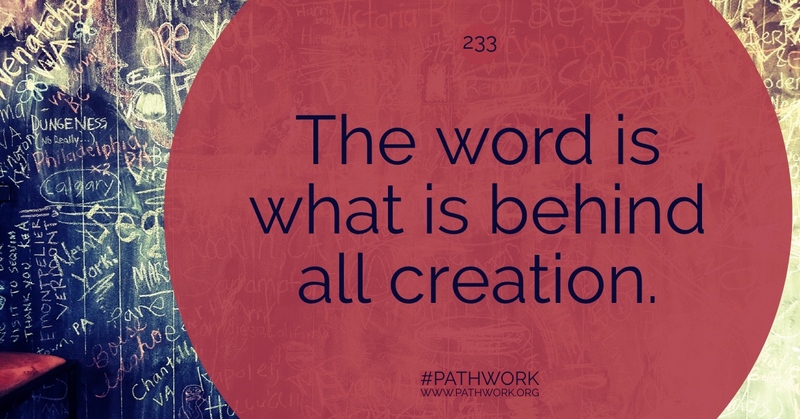 The word is what is behind all creation. Creation cannot exist without a word spoken, known, held, believed in and committed to, in each area of specific creation. The word is a conglomerate of all of these, and more. The word that is spoken reveals the will that motivates this particular utterance. It can be the divine will or the will of the cut-off, ignorant and destructive particle of consciousness. Be it conscious or not, the word is the sum total of your beliefs in any given area where you speak the word. It is the sun that creates the planets. It is energizing force and it is design. So much is contained in the word. It is significant that Scripture starts with the postulate that in the beginning was, or actually is, the Word. The word is eternal. It always will be. God spoke the word and from that word all creation, including your personality, came into being. It is the blueprint behind all you can see, experience, and feel. There are many words bringing into manifestation the diverse aspects of creation—in the planetary system, in the mass consciousness, and in the individual consciousness. How can you apply this truth to yourself in a practical way in your everyday life? Perhaps you will glean from the work on your path that every situation you experience is the product of a word you have spoken, and are perhaps still speaking constantly within, in one way or another, on one level of awareness or another. Our goal on the path is to make all these words you speak, day in and day out, every hour and every minute, conscious, so that you can understand your creation. Most of the time you—all of humanity—are extremely “busy” blocking out the words you speak. You produce noise in your inner system so that you do not hear your own words. You can now contemplate and enter into a new phase on your path to make yourselves very conscious of the words you speak, and what and how they create. The word can also be divided within itself. When you speak opposite words that on different levels of awareness cancel each other out, you become confused and you create accordingly. If you create fog so as not to know the words you speak, to overshadow them with other words, it is necessary to crystallize the word most responsible for the negative creation in your life. Do this with both the positive and negative creations. In a sense you have already done it, but not in such a clear way. Now you are more ready to handle the sharp tool that the spoken word can be. The knowledge of the power of the word has been postulated throughout the ages and is professed in various corners of the earth. But it is often applied on top of the confusing fog and the negative words, without first sifting out the obstacles and counter-currents. I spoke of this a long time ago but only fleetingly, because everyone had so much work to do before I could come back to this topic in a meaningful way. The timing here is crucial. When you speak words of truth and creative beauty but the underlying material is not made compatible with the levels of consciousness that speak these words, you create at best a short-circuit, at worst a split and a division in consciousness. This is why it is preferable for a while to honestly admit and expose the word of your negative intentionality and your lower-self motives. Such an admission implies attitudes of truthfulness, humility, courage, faith—and many other higher-self qualities. But speaking words that reveal principles of divine nature when the lower self is hidden and denied implies attitudes of wishful thinking, pride, lack of faith, fear of exposing what is not perfect, shirking the process of becoming, growing, developing, of transforming in a realistic way. So you see, my friends, it is a matter of subtle awareness when the word of divine, limitless abundance can be spoken in truth. Let us concentrate now on specific words that reach very deep levels of your being. I mean here the word you speak about your own value. There is a direct linkage between the power of the word and self-value. How can you speak the word of faith in your own unfoldment and unfulfillment if you secretly believe that you have no value and therefore no right to experience bliss? How can you even challenge the assumption of your worthlessness that you all carry inside your hearts to some degree if you are terrified that worthlessness is the ultimate truth of your being? Then you can only continue to block this “knowledge” and defend against it. As you know, it is precisely those defensive maneuvers that reinforce your belief in your unacceptability, because all defenses are negative, destructive, and create guilt. So even when you try to tell yourself—belligerently—that you do deserve fulfillment, peace of mind, pleasure and abundance, underneath you will fear not being able ever to attain all this, not really deserving it. You fear that if you did acquire these desirable assets, it would only be by “stealing,” and you would be punished. So as you speak the word for what you long for, what every human being longs for and should indeed experience, you simultaneously speak the word against it on another level. The same duality applies to everything in life. While you are in this state of division and self-denial, you must feel pessimistic and fearful about the world and see it only in fragments, out of context, reaffirming your fearful visions. Thus the process of the pathwork is essential to establish the one-pointed word. Only through the honesty and courage of self-exposure and purification will you gain sufficient initial self-esteem to expose your devastating belief in your valuelessness. Only when you pierce through the superficial substitute maneuvers of false self-value, making room for facing your painful belief in being valueless, can you begin to see this assumption and cast doubt on your self-doubt. In that way you can constantly pronounce words of truth. Even questions can be words of truth. “Is this assertion of my value a defense or a real expression?” “Underneath my superiority and arrogance, do I falter and doubt my intrinsic value?” And when answers to these questions show that these negative beliefs about the self are indeed there, then the word of truth can be expressed, perhaps again by an initial question: “Is it true that this or that lower-self aspect makes me undeserving, unlovable, bad, valueless? Or is there something else in me that would justify my appreciating and loving myself, that deserves esteem and fulfillment?” Such questions are also often words of truth. Begin to see the words you speak to yourself about yourself behind the smoke screen. On those deepest levels you malign yourself by speaking negative words about yourself. Those words need to be crystallized. They may exist only in a vague, hazy, unarticulated way. The power of the word is no less when it is inarticulate. There always is an immense power in it because it is full of energy. Humankind at this stage of development is becoming increasingly aware of energy and its importance. But you are not sufficiently aware yet that the thought and the word itself are energy—energy of a different kind. Every level of the personality is an expression of a different kind of energy. The mental level, feelings, will, the physical level and the level of spirit are different energy types. To feel and recognize the power and energy of the word is immensely important and vastly underestimated. You believe it does not matter what you think, what you say. This is not so. You can say a word with a loud voice or silently, and the silent word is not necessarily less powerful than the uttered word. Many words are spoken with the vocal cords that have much less energy than the internal words, for they are not rooted in strong beliefs. They are lightly said, without feeling or conviction, to fill the void within. The power of these words is an indirect one because they create fog that separates the consciousness from the words spoken within that do have the power, either constructively or destructively. So the lightly uttered words, without impact, without depth or roots, whether they are spoken or are the pitter-patter of thoughts, have nevertheless a serious effect on the creative process that each human being, wittingly or unwittingly, sets in motion. Listen to their underground noises, see their meaning, take enough distance from them so that you can hear and evaluate them. By observing and identifying them, you will gain a better understanding of how you create your life and what your creative process is. See the powerful words you speak behind that curtain, that fog of separation. There are many powerful words you speak, with hidden thoughts that are unclear to your observing consciousness, to the awareness that would permit you to utilize the hidden material. You need to observe and thereby dissolve the fog of the superficial word that is merely meaningless noise and has no substance in your consciousness, either in feeling or in belief. When you have thus clarified your vision of the power of the word, you can listen to your words and contemplate their meaning and be aware of their consequences. Then perhaps you can feel the energy current in each word you speak silently or aloud. You must clearly enunciate and then examine the feelings, convictions, and ideas for their truth and their effect on your life, your behavior, your receptivity, so that you can develop an unhampered perception of reality—your own and others’ and life’s. When the words are contrary to divine unalterable truth and beauty, their energies will take you into a self-perpetuating, involuntary pattern that seems to make life dangerous, alien, something to be defended against. In this pattern you feel like a helpless pawn. But when you discover the power of the word and choose different words, words according to the truth of creation, you create a pattern in which the involuntary process carries you in benign love, in ever-expanding joy and abundance. When you do not have joy and abundance—outwardly and inwardly—you must be speaking a word that denies this possibility for you. If you do not believe in the possibility of joy and abundance for yourself because you secretly—often without conscious awareness—feel undeserving, you often deny that this possibility even exists in creation. That defensive palliative seems perhaps less painful than admitting that you feel too evil and undeserving to have fulfillment. But the conscious awareness may be at first merely a general sense of pessimism, nihilism and vague fears, along with a total disconnectedness from the inner process of self-creation. The feeling of helplessness is overwhelming at this stage. Only when you begin to clearly pursue the chain of cause and effect between your words and your experience will you gain a deep security in which you become part of the creative life process. People who cling to nihilistic philosophies invariably hide the process I just described. This kind of world view cushions them against the painful belief that they themselves are unworthy of love and joy and fulfillment. All of you, my friends, carry such a word in you, some more, some less, some in one way, some in another. Find that word in you. Find the word with which you consistently say, “I will not love, love is dangerous, it will hurt me.” It is another word of untruth that creates its pattern that makes it seem a truth, in which you cannot experience the fulfillment your soul longs for. You are then caught in an involuntary process that indeed manifests that word. The manifestation of the process in your life, the involuntary life you create for yourself, while you believe you have no say in it, is the direct and indirect result of those words you speak—sometimes loudly, without knowing what you say and why you are saying it, sometimes silently, without being at all aware that you say such a word—yet not necessarily unconsciously. For when you begin to observe the ongoing dialogue within, you will often see that your words are there on a quite conscious level, but you do not take notice of them. At other times the words you speak are really not on a conscious level and need to be dredged up. But there are always hints and clues you can follow that make their existence quite obvious, if only you choose to make the connections. In your busyness not to hear and understand your words, you do not take responsibility for the words you speak. I purposely say “words” rather than “thoughts,” for thoughts are only the outcome of the underlying factors creating the word. The word is the energy explosion. The word is that which immediately creates. The thought is the content, the word is its inception, its expression, its realization in its first stage. A thought without the word would be impossible, it would be meaningless, it could not exist. So the thought is the underlying consciousness factor of the energetic process. The spoken word is the finished product of the thought behind it. I repeat: this finished product of the thought—the word—is not necessarily conscious or articulate or vocal. So my friends, take care with your words. Make room for clarity in them. Take responsibility for the words you speak within. Your words are your life creation. Question the words you speak, see whether they come from a thought of truth or a thought of untruth. A thought can be revised, it can be rejected, it can be debated. The word is already the finished product of the thought and is therefore the beginning of the creation. It is that which clinches the thought, as it were. So differentiate between the word and the thought. For example, if you think you are unworthy of the best life has to offer, you can question that thought. But if you speak that word within you, it is already a creation that is taken for granted, never challenged, never debated and therefore uncorrected. And in that way it is given constant power that is not visible or noticeable to you. It is an undercurrent on which the boat of your life, the vehicle of this incarnation, constantly swings and rocks. It is as though you are carried by that current, and indeed you are. But you are no longer consciously connected with the current. You do not know that you created the current through the thoughts that create the words you speak—the unchallenged, unquestioned thoughts you utter within your own mind. So realize that where the creation is undesirable and limiting, you must look for and challenge the word responsible for this state. You must begin to say different words. My dearest friends, it is also important for you to understand that the word that is superficially spoken, while the opposite word persists underneath, will only create a short circuit. So if you say on only a superficial level of your mind, “Yes, I am worthy” this will not work. You constantly pay lip service to many truths in your mind and in your thoughts, saying the words, but you do not challenge the words that are opposite. The only way you can know, at first, that you speak such opposite words at all is by the results and the manifestations in your life. This is the absolute proof of what words are spoken within. There can be no mistake about that. So look at the life situations that make you feel less than happy; acknowledge the involuntary process that carries you in that continuing pattern. And then search within you for the word you say that creates the unhappiness. What is specifically the word in a particular situation? My friends, it will not be so difficult for you to unearth this now. At the beginning of your path, before your present awareness, you would have been convinced that the superficial, positive word was all there was and you would have used the fact that the opposite experiences exist nevertheless as proof that life is unfair and untrustworthy and that your own inner processes have no bearing on it. You would have only convinced yourself further that people are victims of life. Now, however, you have gone deeply enough to know not only your lower self and its negative intentionality, but also your unfortunate hate for yourself and lack of faith in your higher self to deserve fulfillment and to expand and stretch your consciousness into more alternatives for fulfillment. Knowing all that, you will be able to find the words you still speak in various areas of your life. In connection with this I would like to say a few words about receiving and giving. You do know by now—for we have often discussed this and you are beginning to see it increasingly—that giving and receiving are one. But, again, this knowledge is often merely mental and superficial and not yet experiential. Emotionally and experientially there still is quite a division. But you are becoming increasingly aware of the oneness, even within the division. Let me be more explicit. When you speak the word of self-devaluation into your inner being, you must become fearful, you avoid moving out, you prevent your heart from flowing to the next heart. In this miserable state, you believe that all you need to be helped out of this state is to be loved. But when love is given to you, no matter how you long for it, you cannot accept it. You find ways and means to prevent taking it. Here, even in your divided consciousness, you find the unchangeable unity: as you do not give, you cannot receive. Taking in love directly depends on your awareness of having earned the right to do so, of being worthy of it, for if you are not aware of your worthiness, receiving love threatens a worse punishment and exposes you to the pain of your real feeling—which is the sense of worthlessness. And giving your love is equally dependent on that, for you can give love only when you can feel you deserve the pleasure of doing so. You can receive love only when you feel you deserve it, which cannot happen if you do not wish to love. No one else can give you the worth and the love that you first need to extend to yourself. The fallacy of the thought that if you were loved you could then also love, no longer has any room in your consciousness. It simply does not work. It is a false word you speak to yourself on some level. As you try it out and observe it objectively, you will see there is no truth to it. You are often given to, but you reject what is given in sincere love from others and God, from life itself. The word you speak out of this rejection creates the false unity of neither being able to love nor to receive it. Only when you speak different words, deep inside, with all the feelings and all the conviction, as a result of penetrating those deeper levels and transforming the false words into one clear-cut strong creative movement of the word, will loving and being loved become a oneness, and not an impossible division. In a similar way, when new people enter this path and come into the purifying and strong energetic environment of the Center, they will not be able to take in the love. And yet they must first take in what the pathwork and the Center have to offer in order to move on. As they take in the love, so do they give it out. Even in only taking love there is the act of giving it out. Not being willing to accept what is given is a crass form of ungivingness. Taking is already a giving, if it comes from sincerity rather than from the cheating, grabbing, acquisitive little lower self. If you have something to give another and it is not wanted, not taken, it hurts. But when the other takes it, this person gives to you. You must see constantly that in the taking is the giving and in the giving is the taking, the receiving. Even when the process alternates, you will find yourself in one stage more receiving and less able to give, or giving through your sincere receiving. That is all right. Receive in truth and beauty, and you shall become stronger in the other kind of giving too—where you give actively from your resources. Speak the appropriate word to yourself, the word that will create the greater power to give and receive, each in truth, wisdom, beauty, and divine will. It will become an endless flow. Giving and receiving will no longer be differentiated, for they are indeed undifferentiated. But in your words deep inside of you they seem opposites, and thus you create conflict. My friends, pay attention to your words. Observe the shallow ones. Observe the words of untruth, and consider in what way they are untruth. And then have the courage to speak the word of truth. Visualization cannot exist without a word of truth being spoken. This must become very clear to you, so that you can challenge and give up more false words. It seems to take a lot of courage to say the word of truth. For example, “I can and will give the best. I will let God give through me in sincerity, in strength, in truth, in wisdom, in beauty.” Why does it seem to take courage to speak these words, my friends? For several reasons. First, your lack of belief that these words are actually a creation, and will create accordingly, requires bridging the gap from not knowing to experiencing. This gap can be bridged only by faith and that, in turn, is a question of commitment. It is extending yourself into unknown, unexplored new alternatives and vistas—and that is always a matter of courage, a matter of commitment to believing in this possibility, even if you have not yet experienced its truth. The courage to strongly pronounce these words is a necessary step and prerequisite. Faith is always comprised of courage and strength. For another reason, it is courageous to speak the truth because the false safety measures into which so much false faith was invested, often for a long time, need to be relinquished. Unless this is done, the true word cannot be spoken, therefore the creation cannot be forthcoming. The positive, involuntary process that is like a gently rolling sea with an immense and benign energy cannot be set in motion unless you speak the truth. You are experiencing this now in your beautiful venture, the Center. You marvel more and more at what is happening as a strength from within takes over and stretches beyond your limited vision and consciousness. You marvel at it and you are right to do so. Know that this is the result and the creation of the many words of truth, strength, giving, commitment, faith, goodwill and action—in short, of the initial word that set all this in motion—that many of you have spoken. Even though words of untruth are still spoken in those same consciousnesses, the words of truth that are also spoken have created a stronger power. And that power in turn has made it possible for divine spirits and entities and guidance to come forth in ever stronger measure, in conjunction with your own inner divinity. I am sure you all know that in this first lecture of the year you have received a new tool that can now be used meaningfully and that could not have been used this way in the past. Use it, try it, experiment with it and see the beauty of life opening up more and more. The love of all of us in our world constantly flows to you. Receive it. You are blessed. Be in God!